Important: The Suffolk Punch is an open event. You don’t have to be a West Suffolk Wheelers member to take part. What is a Reliability Trial? Way back in the dim and distant past, most cycling clubs organised reliability trials during January or February. They were designed to enable members to test their fitness prior to the racing season, and as they attracted riders from neighbouring clubs they tended to have a competitive edge – however, they were not races. Reliability trials are similar to sportives in that riders are set off in groups and have target times to aim for: some sportives go for gold and silver targets, reliability trials for average miles per hour categories. Unlike sportives there aren’t arrows on every corner (route instructions are provided instead), there are no feed stations and no mechanical back up. The clue is in the title: you must be reliable. For instance: you must be capable of changing a punctured inner tube, because unlike a club run most people are on a mission to get back within a time limit and you can’t rely on members of your group stopping to help. Anyone trying to get round a hilly route in February averaging 18 or 15 mph can’t afford to hang about. As stated earlier, reliability trials are not races. There is no result sheet published, just certificates presented to each finisher with the average mph target time recorded. All riders must obey the rules of the road and be considerate to other road users, riding single file when road conditions dictate (cars waiting to pass, busy section of road or narrow, twisting road). If you think today’s Suffolk Punch is tough, I can assure you it is a walk in the park compared to some of the two day events that were promoted in the 70s and 80s. Haverhill ran the Great East Anglian Rally (GEAR) for several years, which consisted of three (or was it four?) stages over the weekend. Maybe a 30 mile warm up on Saturday morning followed by 40 or 50 miles in the afternoon. Sunday’s stage was around 70 miles. The first Suffolk Punch events in the late 80s were also held over two days, and before that ten years of Lincstour with the same format. 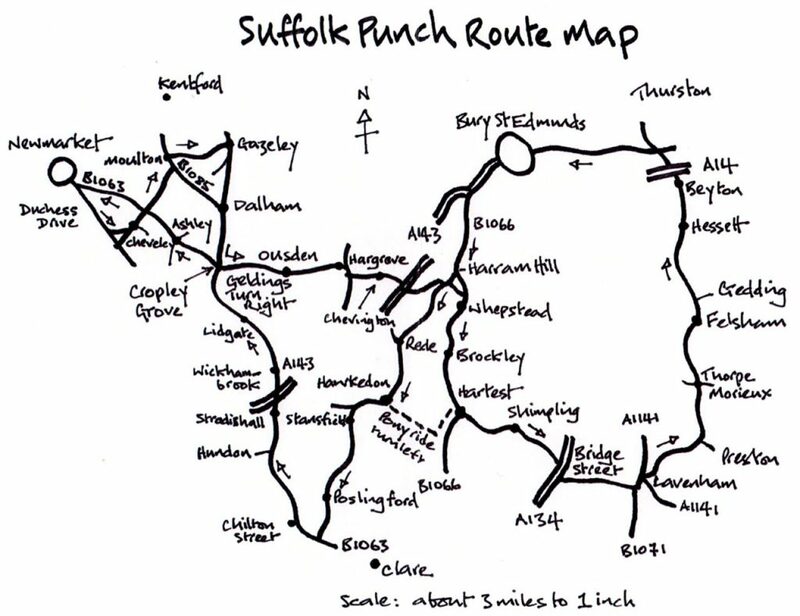 So enjoy the Suffolk Punch safe in the knowledge that your legs won’t be aching from the day before. 1. Start at the WSW&TC HQ in Shakers Lane. LT down Eastgate Street, SO traffic lights and left across Angel Hill. TR into Churchgate St, then immediately TL up Bridewell Lane. At TJ TR into Westgate St and straight over mini roundabouts into Out Westgate and up Horringer Rd. 2. Just out of town, TL onto B1066 SP Whepstead. At bottom of Harram Hill fork-right Take care! into Pages Hill Rd SP Rede. SO at J in Rede and on to Hawkedon. At TJ on Hawkedon Green TR SP Denston and follow road to grass triangle at top of a hill and TL SP Poslingford. Through Stansfield & Poslingford and on to TJ with B1063. 3. TR on B1063 and follow it to Stradishall. Cross staggered XR on A143 Take care! and through Wickhambrook. Continue on B1063 through Lidgate to Cropley Grove. Follow B1063 round to the left and on through Ashley and down into Newmarket. 4. At bottom of hill in Newmarket TL Take care, sharp turn into Duchess Drive 100yds past Suffolk county sign. At top of climb TL down a lane at the end of Cheveley Park’s wall no SP. At TJ in Cheveley TL SP Newmarket. At XR with B1063 go straight over to Moulton SP Moulton. TL on B1085 SP Chippenham and within ½ mile TR into Bridge St and up Primrose Hill to Gazeley SP Gazeley. 5. At TJ in Gazeley TR SP Dalham, and at far end of the village fork-left down to Dalham. At J with the B1085, on a bend,Take care! go SO SP Lidgate to Cropley Grove J and TL to Ousden SP Ousden. Through Ousden to Hargrave. At TJ in Hargrave TR SP Clare in a few yards TL to Chevington SP Chevington. Through Chevington to TJ with the A143 SP Haverhill. TR Take care! in a few yards TL SP Whepstead and on down to Whepstead. At TJ TL SP Bury and in a few yards TR on a sharp left-hand bend Take care! SP Whepstead and up Whepstead Hill to TJ with B1066. 6. TR on B1066 SP Brockley through Brockley Green to Hartest. At the village green in Hartest TL SP Chadacre and climb Hartest Hill. At TJ SP Lawshall TL to Shimpling. At bottom of hill, after very sharp left-hand bend Take care! TR SP Long Melford and ride to Bridge St. At TJ with A134 TR Take care! And immediately TL up to Lavenham. 7. At TJ with B1071 TL SP Bury and ride through centre of Lavenham. On outskirts of Lavenham, by village sign, TR SP Brettenham ride past the edge of Preston St Mary, descend steep hill and TL on a right-hand bend onto tree lined lane. At TJ on bend TR SP Felsham and follow road through Thorpe Morieux. 8. Soon after passing the Bull Inn and Union Jack roof TR down a lane SP Woolpit. At TJ TR SP Stowmarket. In Felsham TL at the Green then TL at TJ at end of Green no SP. After about a mile TR on a left-hand bend Take care! SP Hessett, Through Hessett to Beyton. At TJ in Beyton go straight across SP Thurston (village green on right) and TL at TJ Follow road under A14 to outskirts of Thurston. TL just after the 30mph signs SP Bury. Follow road to outskirts of Bury. The Thurston to Bury road is busy and single file is recommended. Midway to Bury there is a cycleway. You may wish to join it. Take care though as it is popular with walkers. 9. Ride past Flying Fortress pub, straight over roundabout (second exit), through Moreton Hall Estate to next roundabout and go straight over (second exit) down Mount Rd to TL into Shakers Lane Take care, sharp turn! and on to the WSW&TC HQ. Follow Stallion Ride to Cropley Grove and TR to Ousden Take care! then follow instructions from number 5. above. Follow Stallion Ride to Hawkedon Green and TL at the TJ SP Boxted, follow lane to TJ with the B1066. TL and follow B1066 to RT on Hartest Green SP Chadacre. From then on follow instructions back from 6. above. Once downloaded, unzip the folder and then copy the files to your device (refer to your manufacturers instructions, or google it, if you don’t know how to do this. For Garmin devices it usually means copying files into the NewFiles folder on your device). Copyright © 2016-2019 West Suffolk Wheelers. All Rights Reserved.